You’re not alone if you are traveling this Holiday Season. November is upon us and like you lots of people have travel plans approaching from Thanksgiving to New Year’s. In 2017, we had record-breaking travel from November through December, the busiest months for long-distance trips every year. Increasing numbers of homes are left unattended every year during the holidays. Enjoy a worry-free trip this holiday. 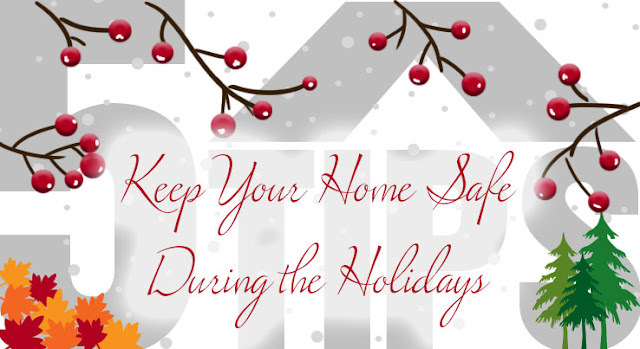 Follow these few tips to keep your home secure while you’re away this season. 1. Keep Up with Home Maintenance. Don’t leave a calling card for potential intruders. Nothing tips them off more than mail, packages or newspapers piling up, overgrown landscape, or snow in the driveway. Make sure you arrange for these few things to be taken care of while you are away. Have a friend pick them up or have your mail or newspapers stopped all together. This news report of a home invasion tells how the thief knew no one was home by the newspapers in the driveway. Don’t fall victim to this simple mistake. 2. Make it look like someone is home. You may have heard this one before, but we often forget it in our time of hustle and bustle to get on the road. Simply adding a timer to your lights to turn on at a certain time can make it look like someone is home. Our outdoor version can double as outside hidden security. Having a dark home is a dead ringer you aren’t there. You don’t need to channel your inner Kevin McCallister in Home Alone, to make your space look occupied. Some other tricks are leaving a pair of shoes by the door, keeping a TV on or keeping a car in the driveway. 3. Lock Up. It’s obvious, but sometimes we forget. A large number of home invasions happen through unlocked entry. Take an extra walk through your home to make sure all the windows and doors are locked while you are away. Lock up or move any valuables out of sight. Also make sure you don’t have any spare keys hidden in obvious places outside your home. 4. Home Security. Whether it’s a dog, alarm system or video surveillance, you will know when someone has entered your home. Our covert video surveillance is disguised in your everyday objects that get overlooked in most circumstances. You can arm yourself with a standalone DVR, WiFi or cloud storage camera. WiFi and Cloud cameras have the ability of notifying you when they detect movement in the area of view. With FREE apps, you can check-in with live streaming, recording and play back options at anytime from anywhere you get a signal. And if your home is broken into while you’re away, you can notify the authorities and have clear evidence of the perpetrator to take to law enforcement. 5. Keep your plans off Social Media. In a high technological society, we tend to overshare. We check-in and post from everywhere. Don’t put your holiday travel schedule in print for everyone to see because that information is widely accessed. Keep a close friend or neighbor in the loop, they can check on your place while you are gone. You don’t need to share right away, if you take any pictures or have any fun experience, post them when you return.